This web page contains working notes for an article authored in 2005 in collaboration with Mark Hooten, which was later used as the feature article for the October, 2005 issue of Coin Values and the August, 2005 issue of Coin World Coin Values Supplement. Although these are notes for the article, they differ substantially from the finished product. Therefore, I would urge those of you interested in this series to obtain those back issues. Additionally, images of my circulated set of Barber halves were used for the grade range of these coins and were featured images throughout those issues. The Barber half series is extraordinarily challenging in mid-grades, despite the laughable Greysheet prices for many of the coins, and this makes it truly a long-term project to complete in F-EF. There are no outright famous key dates such as the 1909-S VDB Lincoln, 1916-D Mercury or even the 1896-S, 1901-S and 1913-S troika of Barber quarters. However, there is a seemingly endless procession of horribly scarce issues. They pepper the series throughout its length and various mintmark combinations. The obvious ones include the O and S-mints from 1892-1897, the 1893-S, 1901-S and 1904-S and the P-mint coins of 1913 through 1915. Difficult coins that are somewhat under the glare of those previously mentioned include the O and S-mints from 1896 and the 1893-O and 1898-O. Much of the rest of the series is viewed as generic, which is mind-boggling. Sleepers include the 1893 and 1903, among others. Truly, there are only a few coins in the entire run that are ever available with little effort in this grade range; these include the 1906-D, 1908-D, 1910-S and 1915-D. Nearly everything is difficult. The 1913 through 1915 Philadelphia issues are difficult because of the extremely limited mintages for each. These three coins have some of the lowest mintages of any regular issue US coin in the twentieth century, yet prices for entry level coins are significantly lower than for other issues with comparable mintages. The 1901-S and 1904-S issues are not scarce in the lowest portions of the grade range as they are fairly available, and priced fairly low, through VG8, after this point they become progressively more difficult to obtain with the 1904-S acclaimed as one of the two undisputed Kings of the mid-grade Barber halves. The other King is the 1893-S which over the years has taken somewhat of a backseat to the hard charging 1904-S, but the difficult of this coin in any grade above a full-rimmed G4 should not be taken lightly. The O and S-mint coins from 1892 and the 1893-O are nearly non-existent in grades above G4 and through EF40, however, each becomes more available as the grade progresses above EF40. This is likely because they were the first issues for this series from these mints, and the coinage was saved quickly from circulation at a higher rate than other years. The remaining coins listed from 1896-1898 are also available almost exclusively in AG3. This appears to have been due to very hard usage of the coins during their time of issue, coupled with their small mintages and presence in the middle of the series, so that very few people were actively removing the coins from circulation while they were still in mid-grades. Also, the O-mint coins are fairly poorly struck, which results I mushy coins that lack fine details. 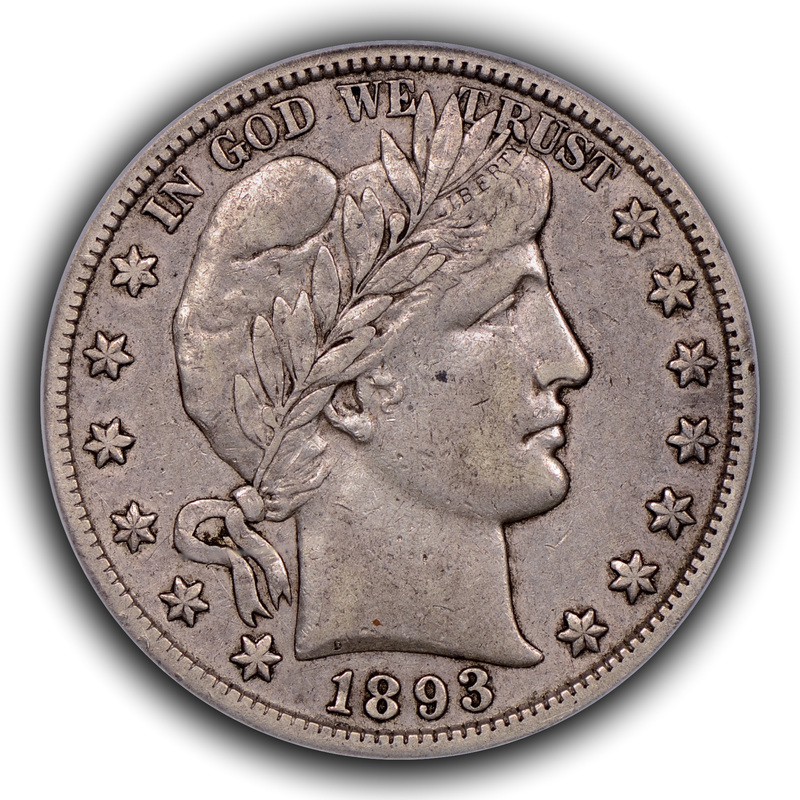 The prototypical examp0le of this is the 1898-O, which is viewed by many non-Barber collectors as a generic coin, yet is perhaps one of the toughest coins to find from F12 through EF40. 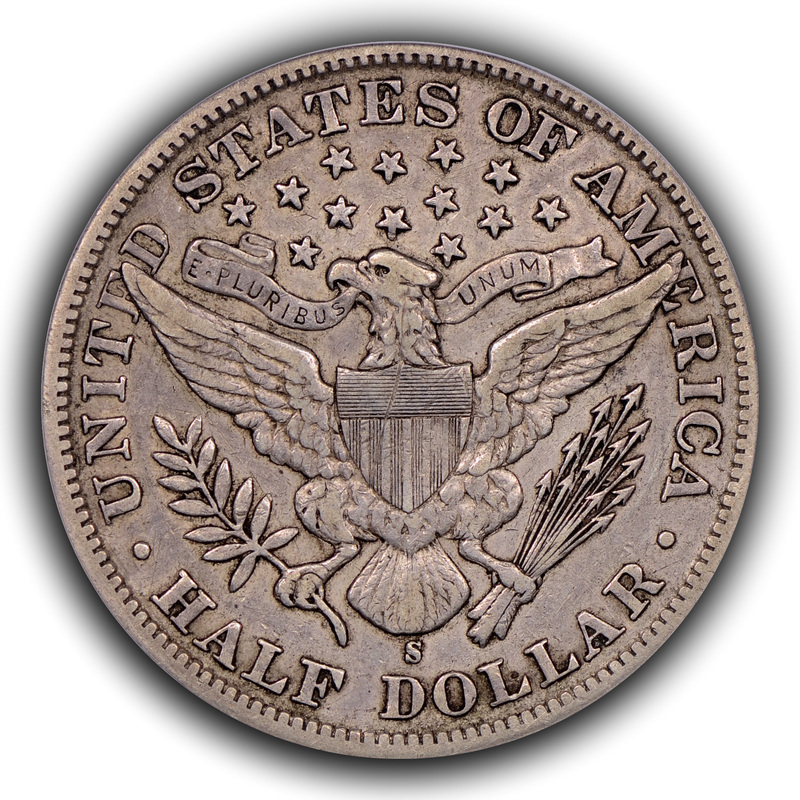 Unlike today, half dollars were a workhorse of the economy when Barber coinage was issued. These coins saw continuous usage and were not saved in any great numbers. This is evidenced by the sheer volume of AG/G Barbers that are available at any show or on the web. David Feigenbaum had estimated that the average grade of extant Barbers is only about AG3 or slightly better. That is incredibly low and is even more amazing when one considers the numbers of low-grade coins that were likely melted in the 1970s and 1980s silver booms. The reverse of this series is not as well protected as the obverse; therefore, full-rim reverse coins with good eagle wing feather detail are not the norm. P, D and S-mint coins minted prior to 1909 generally had a fair amount of detail when struck, and this allows for some letters of LIBERTY to survive even down to the G4 grade. The letters of LIBERTY are set below the highest points of the coin and these will be evident, or partially evident, on low grade coins. LI and TY sit on the lower plane while BER is struck on the highest portion of the obverse and will quickly wear away, from the lower portion of the letters on up to the tops. Wear will also become evident near the nose and mouth of Ms. Liberty and work its way to the ear and neck as the coin is more heavily circulated. O-mint coins are typically weakly struck, with the lower portion of BER not visible on coins that may otherwise have VF30 or better details. In 1909 a new hub was introduced and this hub had a substantially stronger LIBERTY in the headband. The resulting detail allows lower grade 1909 coins to have a full LIBERTY even down to otherwise VG8 details. Collectors who rely on LIBERTY alone to determine if a coin is VF20 will make mistakes along the way until they realize that the coin in balance must be viewed to determine the grade. These mistakes may be costly in that collectors will overpay for overgraded coins that have a full LIBERTY and are graded VF20 yet have overall details consistent with F12, and they will be costly in that the opportunity to acquire otherwise choice VF30 coinage may be passed up on earlier pieces simply because BER is not complete. Mid-grade coins that are nearly a century or more old should look like they spent time in circulation and should have surfaces that do not look as though they were minted last year. Generally, as Barber halves progress down the grading scale, they will have darker areas gather around the periphery of the obverse and along the edges of the reverse devices. These areas may make the open fields look less dark, though still deeply shaded in a grey and auburn mix. Luster is rarely evident at the VF30 grade and, if it is there, it should typically cling around raised and protected devices such as the obverse stars or date. It should also be covered with a layer of patina that masks it. Coins that have been stored for significant periods of time can take on almost a cameo appearance with very dark edges and lighter colored devices in shades of rose or cinnamon. My opinion is that an AG3 to VG10 set looks even, as does F12-EF40, however, if one were to include AU coins in the set then the lowest grade to really consider would have to be EF45 or so and the AU coins would necessarily have to be mostly darker, non-dipped coins. More important than a strict grading criterion is the ability to purchase coins that have similar surface preservation. That is, coins with a similar tonal quality. Many people will attempt to fill out their sets with low-grade AU coins for the more challenging mid-range pieces. Oddly, the Barber half set is significantly easier to put together in AU50 and above that it is in F12 through EF45. Many of the extant AU50 and above pieces, however, will show telltale signs of abuse in the past. This most often manifests itself in the form of an inappropriate dip, which results in a coin that has had its patina stripped and that is too bright for its age and wear. A completely original Barber half dollar. Notice the grey coloration, retained dirt around the raised devices and spots of gunk. The corresponding reverse to the paired obverse. The color matches beautifully and tones over the old scratch through the busy portion of the central shield. My experience is that unless a dealer specializes in Barber halves they most likely do not have a firm grip on the difficulty of the coinage. A perfect example would be an experience I had at a Baltimore show in 2004 where a national dealer had a dark, completely original NGC VF25 1892-O Barber half in his case. I asked to see the coin, asked for a price and immediately wrote a check for the coin. As I was paying, he was standing in front of me and told his partner that I had just made a bad purchase, since the price structure for this date was relatively flat. The coin starts with a high basal value and levels off until AU50. He mentioned that I would have been much better off waiting for a higher graded coin to come along and then to buy that coin for relatively little extra money. I could tell instantly that he had no clue how difficult this series is and, after I safely and securely had possession of that coin, I told him how I would buy scores of this date in this grade at his price if they were available. I also told him that this was not like an 1893-S Morgan where you would find dozens at a show that size. Essentially, he had sold the coin at a fraction of its true worth because he was not familiar with the series. Until recently few Barber halves had been slabbed in mid-grades, likely because there were few coins available and also because the market had previously not valued these coins enough to give collectors or dealers the motivation to have them graded. That leaves most of what is currently available as a raw coin. Certification does not protect one from previously abused coins, either, as the market acceptability of worked-on Barber halves seems to be rather liberal, and problem coins can be found in every grading service holder. There is not a large, avid collector base for varieties of Barber halves that would be similar to Capped Bust half dollars. The best known is the 1892-O Micro O that used a Barber quarter mintmark punch. There are several dozen of these known, in all grade ranges and stages of originality, and the competition to obtain them can be fierce. A long sought after variety is the 1898-O Micro O that had been believed to have surfaced in mid-range around the year 2002. It now appears that this single publicly known example may not be a genuine example of this variety, which precludes its inclusion as a known variety. A new design hub was introduced in 1901 and this has resulted in O and S-mint coins being known with both hubs. The major difference in the hub was that cartilage in the ear of Ms. Liberty was reworked and appears to be more pronounced. Additionally, several varieties of S mintmark appear to have been employed. Most extant Barber halves have some sort of problem. Low-grade coins have often been cleaned harshly, and are occasionally seen slightly bent or corroded. High-grade pieces are typically dipped, though harsh cleaning is unfortunately also a major factor. Many of these lesser manipulated coins make their way into the holders of certification services. Barber halves in the VF20 range that have been dipped will simply be too white, with a flat texture devoid of luster that might even appear polished. Usually, they will tone near the edges and this toning is often in the muted blue and yellow realm. Coins that have been intentionally darkened may look muddy blue and rose and will have fields that are too clean; that is, the fields will have no protective patina on them as it has been stripped off. Generally, a lack of patina on a coin below VF30 in an indication that the surface has been taken away at some point. Experience has taught me that virtually every 1893-S or 1904-S Barber I F or VF will be either grossly overgraded, bent, corroded, scrubbed clean, holed and mounted or some combination of the above. They simply do not exist in meaningful numbers with original skin. These numbers are not completely precise, but they are a good approximation of what I found and inspected. There were about 600 raw Barber halves that I physically picked up and looked at. Most of these did not require anything more than a glance to reject. Of the 600 coins, I would estimate that 70% had problems that were more than something minor. Most had been improperly cleaned, some had lacquer, paint or tape residue, many were deeply scratched; there were substantial numbers of coins with bad rim dings, and a few had graffiti. Of course, there were also those coins that had multiple problems. If the problems were ignore, there were 10% that were no better than FA2, 30% no better than AG3, 60% no better than G4 and 80% no better than VG8. A net grading of the coins would lower the overall grade distribution. Likely 60% were dated 1906-1915, 20% dated 1900-1905 and 20% dated 1892-1899. The slabbed pieces were mostly ANACS for circulated pieces and many had problems. The MS and PF pieces were nearly exclusively in PCGS and NGC holders and most of these did not have much eye appeal. Of course, there were some stunners, too. Please note that this observation was prepared prior to the more recent explosion of Barber half dollar certification and that in more recent shows the majority of certified, circulated Barber half dollars have been in PCGS holders. Those previously certified coins in ANACS holders appear much less frequently and may have been cracked out for albums or for certification at another third-party grader. Enjoy this series. Take your time and include coins that match your aesthetic appeal and budget. It can be a long and rewarding experience.